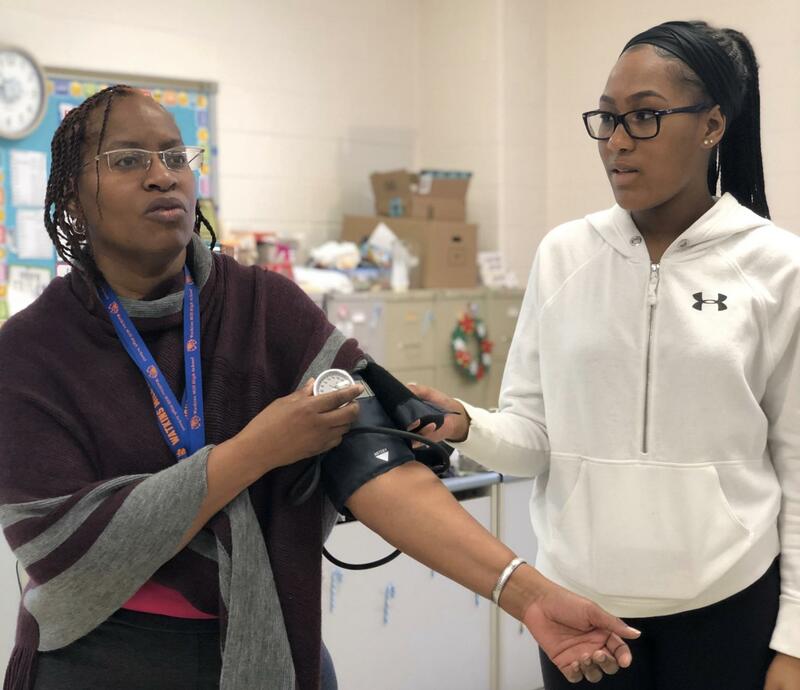 Medical careers teacher Paula Mascendaro demonstrates proper blood pressure technique to senior Taylor Johnson. Students were not permitted to take pictures on the field trip to protect patient privacy. Students in the medical careers program at Watkins Mill got the opportunity to experience a day in the observational room of Inova, a teaching hospital in Virginia, on November 26 and 27. The first group of students went on Monday and the second on Tuesday. Five parent and teacher chaperones volunteered to drive their own cars. They picked up all 23 students at around 5 am and headed to Virginia, which is where one of the only hospitals in our area that offers the opportunity to observe open heart surgeries is located. At the arrival of the first group, a cardiac nurse in charge of the observation gave students an introduction. She then continued to provide the vitals of the patient and demonstrate the procedure on an artificial heart. During the surgery, which took place in the hospital’s only observational surgery room, students were also given the opportunity to ask any questions they had. “I want become a pediatric surgeon, so I feel like the experience of seeing an open heart surgery is a really good start,” senior Jordan Gaboton said. The second group of students were unable to observe an open heart surgery due to a change in the hospital’s schedule for use of their observation room. Instead, they observed another unusual procedure, which was much less time consuming. “I was very disappointed about [the second group of students not being able to see the heart surgery]… unless a student goes to medical school (where this still may not happen) or works in the operating room, they may never get the opportunity to observe an open heart surgery,” medical science teacher Paula Mascendaro said. The heart procedure, which usually takes about four-and-a-half hours, reinforced what students learned from the Medical Science curriculum. A study of the cardiac system is usually covered at the basic level in Foundations of Medicine and Health Science, the year before Medical Science, which allows students to explore the topic in more depth. “I like how the career programs at our school are helpful in narrowing down the right path for us individually. It gives real life experience in fields we choose which just helps us decide if it’s really for us,” senior Desiona Tillman added. “This observational experience is very popular, if you do not submit a request in time, you may not be able to obtain a day or two to participate… the demand gets greater each year,” Mascendaro added. The school’s spot for next year’s observation is already in the works of being secured.